Small-scale farmers can easily collect and analyze their farming data including weather, soil, water, and pest monitoring data in their mobile device. Farmers will be in a better position to comply with the U.S. FSMA Law, the E.U. Food Law, and GLOBALG.A.P. certification. Get the OASIS Mobile Edition and the OASIS Analytics Edition. Get the OASIS Traceability Edition. Farmers can get training and assistance in analyzing soil properties, estimating right amounts of fertilizers to apply at the right time, and developing management plans. We'll help you to achieve harvest yield by effectively using all of your farm inputs. Farmers can get training and assistance in understanding the microeconomics of agricultural production, and as a result can see a net positive return from farming. We'll help you to turn your farm into a successful business. Computer users just need one user account to log in to the OASIS Information System, the Two-way Strong Payment Processing System, and other systems. The User Authenticator mobile app provides increased security to protect against unauthorized access. It turns your mobile phone into a virtual identification card that can be used to verify your identity. Consumers can send payments directly to merchants and other registered users, by using a mobile phone and the Budget Manager mobile app. Merchants can receive payments directly from customers, by using a mobile tablet and the Merchant Register mobile app. You don't need a credit card, a debit card, or a bank account. Get the Budget Manager or the Merchant Register. Small-scale farmers can easily collect and analyze their farming data including weather, soil, water, and pest monitoring data in their mobile device. Farmers can provide assurance to retailers and consumers that their crops had been grown on their farm fields. Farmers can get training and assistance in analyzing soil properties, estimating right amounts of fertilizers to apply at the right time, and developing management plans. Farmers can get training and assistance in understanding the microeconomics of agricultural production, and as a result can see a net positive return from farming. Computer users just need one user account to log in to the OASIS Information System, the Two-way Strong Payment Processing System, and other systems. Consumers can send payments directly to merchants and other registered users. Merchants can receive payments directly from customers. You don't need a credit card, a debit card, or a bank account. New farmers can sign up and start managing their farming activities with their mobile smartphone. There's no cost to using the farming essentials features. Download and install the OASIS Mobile Edition. New consumers can sign up and start sending electronic payments. New merchants can also sign up but will be contacted to be approved to start selling their products on the Two-way Strong platform. There's no cost to sign up. Go here to register for a Two-way Strong user account. Easy to Manage the Farm and Track Agriculture Products! Everything begins with defining the farm plots or farm fields. Click on the "New" button to create a new farm plot. One farm can have many fields. A single farm plot shows what was planted and when, the number of plants, and a unique identifier. If livestock is also managed, another farm plot can show what animal species and the number of heads use that specific land area. One field can only have one product (a plant or an animal) associated. A farmer can then click on "Farm Activities" to view the progress of activities for every farm plot across the growing season. The unique identifier is automatically tied to all activities that will have been carried out to manage the specific field and product (patent pending method). When the harvest is ready for shipment to the buyer, the farmer can click on the "Label" button to prepare and print product labels. See the example below. The farmer can attach the labels to the product boxes. Because the label is generated at the time of creating the farm plot, the farmer's buyer can receive a copy of the product label in advance. In this way, the buyer will be able to check on the growth and health of the crop from date of planting to date of harvest. The buyer can be kept informed and thus can provide guidance when an issue arises. The farmer selects one product variety for each farm plot. The product can be a plant variety or an animal species. If the selection list does not have a specific variety, the farmer can add a new product variety. The farmer will select the country of origin and either a city or a village to show the location of the farm plot. A new city or a new village can be added, if none are available in the respective list. Other data for the new farm plot include the name of the farm, the farm plot identifier, the planting or start date, and the product population. The land area (plot size) is optional. The software allows the farmer to define his own plot identifier, which can consist of letters and numbers up to 15 characters. The software generates a unique product label for each farm plot. The downloadable document presents two layouts. 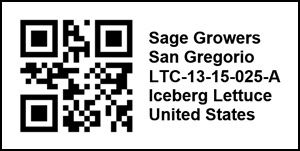 One layout shows the QR code symbol along with the unique identifier and the name of the farm. Another layout provides more details to show the product, country, and specific location. If privacy is necessary, the farmer can download and use just the QR code symbol image. The product can still be tracked by scanning the QR code. 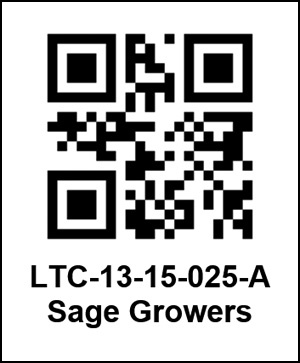 Try it now with the OASIS Traceability Edition and scan the example. 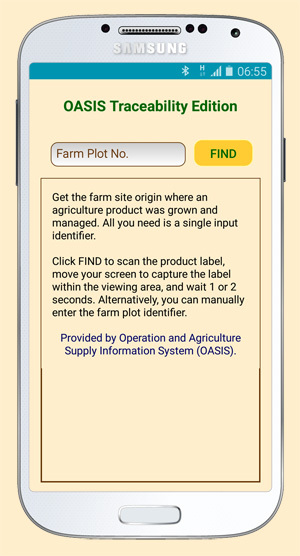 If a consumer wants to find out where a specific fruit or vegetable was grown, she can scan the product label or enter the unique identifier in the OASIS Traceability Edition mobile app. 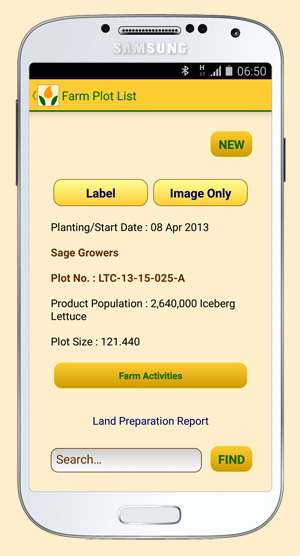 Basic information about the farm plot or farm field will display. Note that the Traceability Edition is a limited version for the general public. 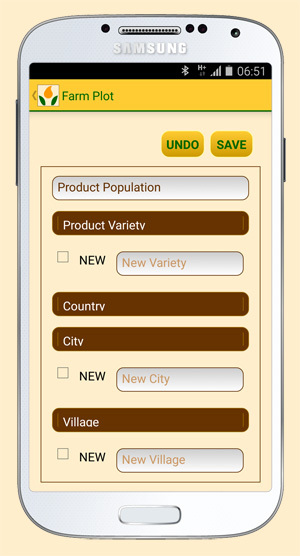 The farmer may use the full version Agriculture Product History mobile app to view key statistics about the product's growth, health, quality, and management. This customized version can be provided to the farmer's buyers, partners, and extension agents. Start Using the OASIS Mobile Edition. It's Free! More information on using the software is in the user manual. Operation and Agriculture Supply Information System, LLC (OASIS) is a private company in the state of Maryland, providing packaged and customized computer software for businesses and consumers worldwide. OASIS develops, markets, and licenses its products under two brands: Two-way Strong and OASIS Information System. Our long-term objective is to improve efficiencies in markets where our customers can make sound decisions based on accurate data collected in real time. All of our customers maintain ownership on their data. The OASIS Information System proved its usefulness for private farms that export horticultural products from Africa to Europe. A foreign government agency that manages irrigation canals and supports small-scale farmers in Ghana also found the OASIS Information System practical. Our proof-of-concept had demonstrated an efficient approach to keep all actors in the agricultural value chain informed on progress and issues. American and European food processors and distributors will see the value in this system as they acquire raw commodities from foreign sources. We now support other value chains in other continents. A critical need for using the OASIS Information System is to comply with the U.S. FSMA Law, the E.U. Food Law, GLOBALG.A.P. certification, and other regulations and standards that provide rules and guidelines for food safety and environmental protection. We are located in the Baltimore-Washington metropolitan region.